Catherine: One thing? That's tricky! I can narrow it down to three: spending time with my family, friends and children, being in nature and practising yoga. C: I started doing yoga to challenge my body physically and to help stretch out my tight muscles after all the running I was doing. I got hooked on the philosophy and the sense of peace it brings to my inner world... which helps me to be more open and available to everything in the world around me. 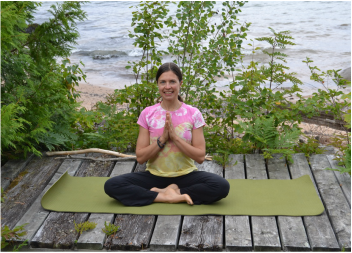 C: At first, I only wanted to deepen my own yoga practice - swadhyaya, or self-study. As I learned more about this beautiful practice, I became excited to share it with others and to help them find "their yoga." C: Time. With a young family and teaching in an elementary school, life is happily full. I have found that I need to change how my practice looks (length, location, small children running about) and, at the same time, still honour that time on my mat each day.